I stood on the back porch leaning against the house, shoulders drooped, hair covering my face as tears fell drip by drip onto the cement. I’d taken the trash out, but wasn’t quite ready to go back into the house. I was hoping I could also dump the trash in my soul right there on the ground. It hadn’t been a “super” Sunday, and as twilight covered the sky, the heaviness of the week ahead covered my heart. We trudged back into the house, and I took a deep breath. Change is never easy, and this week I’m embarking on a big one. This Thursday, after 3 years at a part-time job I have absolutely loved, I am saying goodbye to some of the best co-workers and volunteers ever. In an unexpected turn of events that only God could orchestrate, a full-time job as a managing editor at a wonderful ministry fell into my lap. Next week, I’ll be sharing the details about my new position and the ministry I’m joining. It’s an exciting opportunity to join another great team and pursue a mission I am so passionate about. But first, this week I am saying farewell to so many good things. And that is never easy. As I sniffled on the porch this past Sunday evening, knowing the coming week would be tough, these 6 things ran through my mind and became a prayer for strength, grace, and the ability to transition well. Admitting your struggle and need for help in the midst of change opens the door to see how God provides through his Spirit and His people. Acknowledge how the change affects others. In the middle of a big (or even small) life change, it can be easy to keep our eyes on ourselves, particularly if we are the ones the change affects most (ie: you’re the one taking a new job!). Remember to check in with those around you – your family members, your kids, your co-workers, anyone who is also affected by this change. A simple “How are you doing with all this?” can go a long way. It’s also a way to honor God (see above!). Keep an eye out for all the little details. Write them down so you don’t forget! And when you start to doubt that you made the right decision, or that God is with you in the change you didn’t ask for, turn back to those notes you’ve written to yourself. 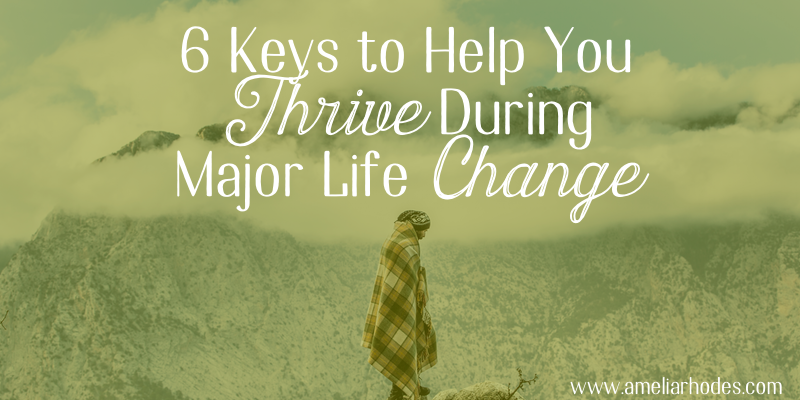 We think we will remember all these details that happen during a big life change. But as time passes, all those cool “only-God” moments can start to fade from memory. So write them down, even if it’s nothing more than a string of words to remind you of His stories of provision. Keep a record of how you see God in all the details in the midst of a major life change. I’ve often say in the middle of “what if” give thanks for “what is.” All those things you list listed about the provisions you’ve seen from God? Give thanks for those over and over. Express thanks to the people who’ve walked with you through this season of life. Sit down and write notes of thanks to those who’ve poured into your life not just in this season, but in seasons past too. In the middle of what if, give thanks for what is. Expect to have lots of ups and downs. We know our emotions are unpredictable and untrustworthy. One minute we’re sure this was the right decision. The next, we think we’ve made the worst decision ever. One minute, we’re certain it’s all going to work out for good and God’s glory, the next we’re certain this situation only leads to failure. But the other thing we can expect is that God is with us and that He never changes, even though our emotions are unstable. So, remember, CHANGE – Confess, Honor, Acknowledge, Notice, Give thanks, and Expect. These 6 things are keeping me focused during a pretty big life change. I hope they’ll help you too. How do you handle life changes? I’d love to hear your tips and stories too. I can’t wait to share with you the story of my new adventure and all the God-moments along the way. Jessie Clemence’s book is a must-read for those going through a stressful season. She addresses life change throughout the book. Get it here! I am a historical fiction lover, and in the midst of life-change, I love immersing myself in an inspiring story, especially if it’s based on history. Jocelyn Green’s newest novel fits the bill and follows a woman feeling the French Revolution and her journey to freedom and a new life in America. It’s a fascinating and beautiful story of hope and new life. Get it here! Change can often come with a lot of fear. Carol Kent’s classic book Tame Your Fears is perfect for a season of change. I’ve heard her share some of these stories in person. She has lived a faithful life through many challenging life changes and is a wise teacher. Get it here! Thank you for this, Amelia, and for your vulnerability. Change is a mixed bag and your acronym is something I’ll remember as change enters my life. So good! And Congrats!! 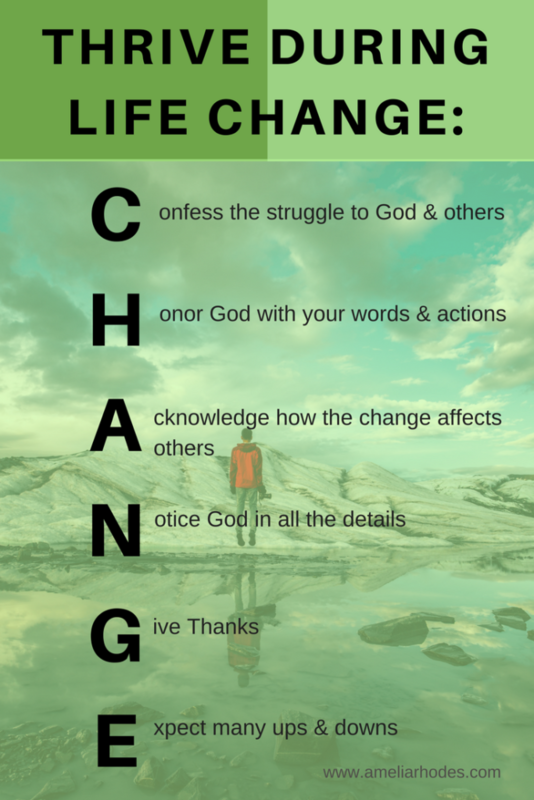 I really love this acronym for change thank you. Wishing you Gods richest blessings in your new job. Amelia is now scheduling events for 2018. Please use the contact form to connect with her about your event.